Blog » Health FAQs - Frequently Asked Questions » How Many Almonds To Eat Per Day? Almonds are undoubtedly one of the healthiest dry fruits available. It is high in proteins, carbohydrates, vitamins and other essential nutrients. Therefore, almonds serve as a healthy snack to the health-conscious society. But, the question that puzzles numerous people is “ How many almonds to eat per day? ” Don’t worry, the answer to the question that is still unanswered to millions of people across the country is right here. None of you must be willing to lead an unhealthy life. However, your hectic lifestyle does not allow you to take proper care of yourself. Being in the office or at home or while traveling; in between the meals, you often tend to lay your hands on delectable yet unhealthy delicacies. The lust for having something appetizing can arise anywhere anytime. How about carrying a fistful of almonds wherever you go? They can be easily packed and carried along. Eating almonds is far better and healthier than latching onto those fried chips or junk food. Now you must be wondering how many almonds to eat per day? How many should you carry along? Is it good to have almonds all day? Well, get your facts cleared here. Know how many almonds to eat per day. Image source: Google. As per the recent research study on almonds, it has significantly been noticed that at an average of 15 almonds are enough to fetch benefits from. So if your diet chart does not have almonds included, revise it now. Get entitled to multiple benefits with respect to eyesight, brain power and immune system that almonds have to offer. Now your answer to ‘How many almonds to eat per day’ has been addressed to a great extent. But, I am sure the question of why you should eat almonds is another crucial question knocking your minds. There are numerous health benefits associated with almonds. Therefore, don’t think twice before adding it to your daily diet routine. Given below are a couple of the benefits of almonds. Almonds bring with it a pack of nutrients essential for overall growth and functioning of a human body. It contains proteins, potassium, and carbohydrates, Vitamin E, Calcium and Magnesium. Who would want to maintain a distance from such healthy yet tempting snack? Another important factor that makes Almonds a favorable delicacy. It fosters weight loss. They are believed to contain a healthy and heavy fat that calms down your hunger and rule out the desire to having tidbits throughout the day. Moreover, it is a low-calorie food. Lesser you much on, lesser will you put on the weight. Also read about: Fiber Rich Indian Foods. Since almonds are full of nutrition, they strengthen your immunity system and make you capable of combating any bacterial infection easily. What Happens When You Eat Almonds In Excess? Till the time you are consuming a substantial number of almonds as a daily routine, you are good to go. And, you don’t have to worry much about the question of “How many almonds to eat per day” question necessarily. However, if you believe in the theory of ” the more, the merrier” you might be terribly mistaken. And, here are some side-effects of eating too many almonds. Almonds are high in Manganese. Consuming excessive of manganese restricts other medicines to perform their respective roles. When manganese comes in contact with other drugs, it sabotages their effect. Although vitamin E is productive for your body, if taken in excessive amounts can lead to multiple health issues like vomiting, headache, diarrhea, lethargy and pain in stomach. 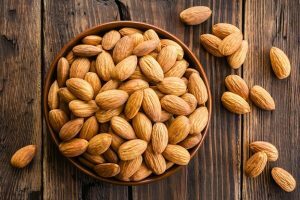 As almonds contain proteins in higher amounts, the issues related to uric acid can soon be noticed in people consuming more almonds than required. Related reads: Uric Acid Diet Menu. The million dollar question of ‘How many almonds to eat per day’ is finally answered. Therefore, go ahead and eat almonds. But, don’t ignore what happens if eaten beyond the requirement. Always remember, everything is beneficial if taken in a limited proportion. Also, read about: Dry Fruits Benefits in Hindi.